For one year, 365 days, this blog will address the Common Core Standards from the perspective of creating an alternate, ambient learning environment for math. Ambient is defined as “existing or present on all sides, an all-encompassing atmosphere.” And ambient music is defined as: “Quiet and relaxing with melodies that repeat many times.Why ambient? A math teaching style that’s whole and all encompassing, with themes that repeat many times through the years, is most likely to be effective and successful. Leaving Grade 1 today, and moving on to Grade 2 tomorrow, a magical story from France that correlates to the number 3: The Prince in the Black Scarf, will round out the Grade 1 posts. 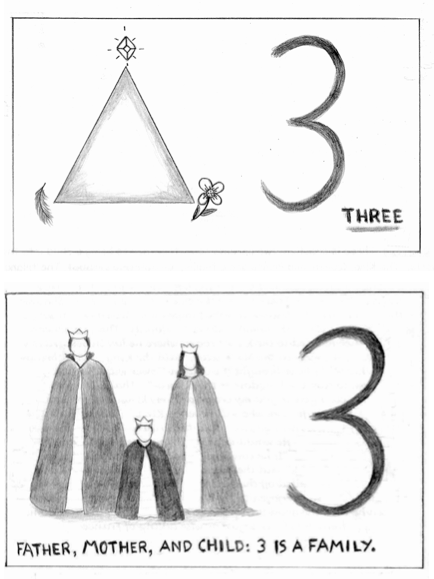 Look below for drawings and captions to accompany the story, noticing how the triangle relates to both the story and the number 3. Knowledge ensues in an environment dedicated to imaginative, creative knowing, where student and teacher alike surrender to the ensuing of that knowledge as a worthy goal. Tune in tomorrow for Grade 2!